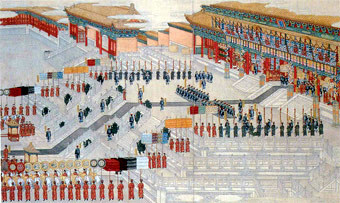 Imperial civil servants, all jinshi graduates, parade before Emporer Guangxu (ruled 1875-1908) on the occasion of his wedding. In the Sui and Tang dynasties there were several types of open civil service examination. Most popular were the Classical Examination, which involved tests in the Confucian classics, and the Literary Examination (jinshi), which demanded a less extensive knowledge of the classics but required candidates to write various forms of verse. In both tests candidates had to write essays on moral principles and practical administrative problems, and to show a good knowledge of Chinese history.